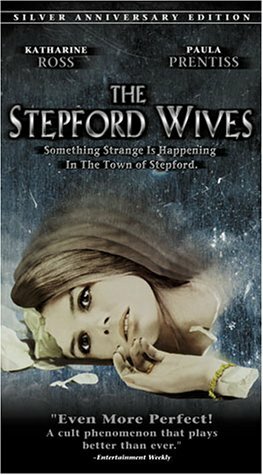 "Something strange is happening in the town of Stepford, Connecticut. Where the men spend their nights doing something secret. And every woman acts like every man's dream of the perfect wife. Where a young woman watches the dream become a nightmare. And sees the nightmare engulf her best friend. And realizes that at any moment, any second - her turn is coming. "No suspense / thriller in the history of the cinema has left a more lasting impression on audiences than The Stepford Wives. For two decades its title and what it implies have been ingrained into our vocabulary and consciousness. "The talent associated with this classic is impressive. Katharine Ross and Paula Prentiss star and seven-year-old Mary Stuart Masterson makes her film debut playing the daughter of real-life dad, Peter Masterson of The Exorcist. Other cast members include Patrick O'Neal, Tina Louise and Dee Wallace." Think of it as a cross between Invasion Of The Body Snatchers and Westworld (1973), in which Richard Benjamin played a guy who went to a place where smiling androids see to your every need (including the bedroom). And Richard Benjamin at the time was married to Paula Prentiss of "The Stepford Wives," which completes the circle. Joe Bob's review of "Invasion Of The Body Snatchers"
Ira Levin also wrote the book that became the movie "Rosemary's Baby"
© Bill Laidlaw. All Rights Reserved. Plagerized stuff in quotes.